The wine program at Buck’s T-4 is known for its combination of familiarity and adventure in wine selection. Much thought goes into their choices, and, to them, the stories behind the wine are just as important as the wine itself. Their wine list has been the recipient of Wine Spectator’s prestigious Award of Excellence since 1995, featuring over 175 selections from dozens of wine regions around the world. Tucked up at the base of the Beartooth Mountains, Carbon County Steakhouse emphasizes California wines. 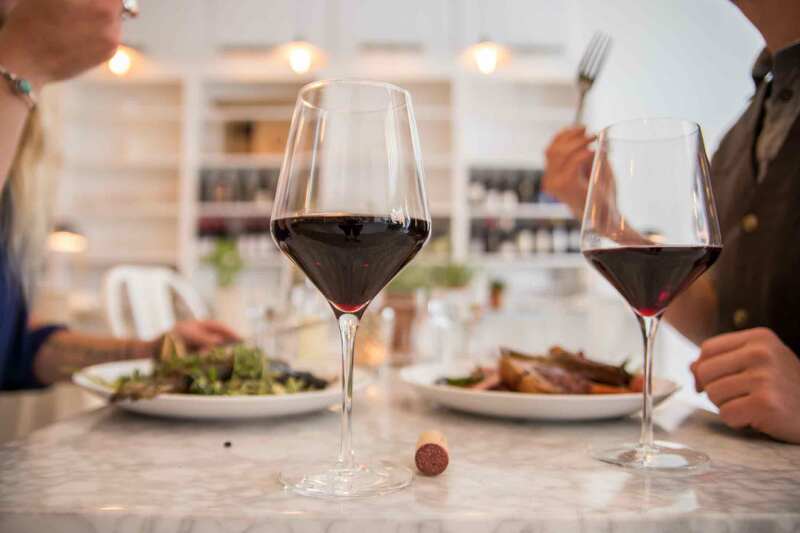 With more than 155 wine selections and an inventory of more than 500 bottles, it stands to reason that they have a Grand Awarded Wine Spectator list. Ask about the perfect pairing for their mouthwatering specialty—the Cowboy Coffee Ribeye with a sweet-spiced rum coffee sauce. Visitors and locals alike love the magic of Chico Hot Springs, venturing from across the country or just down the road to return again and again. Chico’s wine list has been regularly recognized by Wine Spectator and their dining room is known for an inspired spin on classic dishes. Their private wine cellar, Tasting Room, is perfect for private dinners for 2 – 6 people. To say this is a special experience is an understatement. Located in downtown Bozeman, Corx features a delightful collection of boutique wines. The intimate atmosphere is perfect for sharing a delicious appetizer and inspiring conversation. You’ll find the perfect pairing for nibbles, like stuffed mushrooms, cheeses, lox and, of course, dessert! Granted the Wine Spectator Award of Excellence in 2017 and 2018, this 5 star restaurant features wines from around the world. Exceptional dining aside, what makes this restaurant extra special is the location. Just a few miles outside of town, you’ll gaze at picturesque views of the Spanish Peaks, a tableside trout pond, grazing deer, eagles, hawks and the occasional rainbow. After an exciting day exploring Yellowstone National Park, Madison Crossing is the perfect spot to relax over fine wine and a delicious meal. Built in 1918, the restaurant is housed in the first school built in West Yellowstone. With their selection of wines from around the world, you’ll find a perfect accompaniment to their hearty dishes. Built in 1890 and listed on the National Register of Historic Places, The Grand Hotel is a Yellowstone Country gem. Book a stay in one of the turn-of-the-century-decorated rooms and enjoy an evening of fine dining, exceptional wine and lively conversation with the local crowd. The wine list tucked away in this little western town can hold its own against those found in many urban areas. This little bistro is built on the belief that great food and wine make life more pleasurable. Everything is made from scratch in this classic French restaurant. Each Sunday, a prix fixe (multicourse) menu takes you on a European culinary adventure, complete with wine pairings from the featured region. This is only a sampling of the culinary delights in Yellowstone Country. Click here for more food and wine ideas!